ONI Bureau: Eminent national leaders and dignitaries from the world of Politics, Industry, Art, and Social Work congregated at The Ashok Hotel in New Delhi to pay tributes to late Dr. Bansidhar Panda at a prayer meeting this evening. Vice President of India M Venkaiah Naidu, Former Prime Minister Dr. Manmohan Singh, BJP leaders LK Advani, Murli Manohar Joshi, Union Ministers Ravi Shankar Prasad, Piyush Goyal, Rajyavardhan Singh Rathore, Suresh Prabhu, Prakash Javadekar, Congress leaders P Chidambaram, Salman Khurshid, Mani Shankar Aiyar, HR Bhardwaj, BJP leaders Nalin Kohli, Arun Singh, Anurag Thakur, MJ Akbar attended the prayer meeting to remember late Panda. Around 500-600 people were present at the occasion. 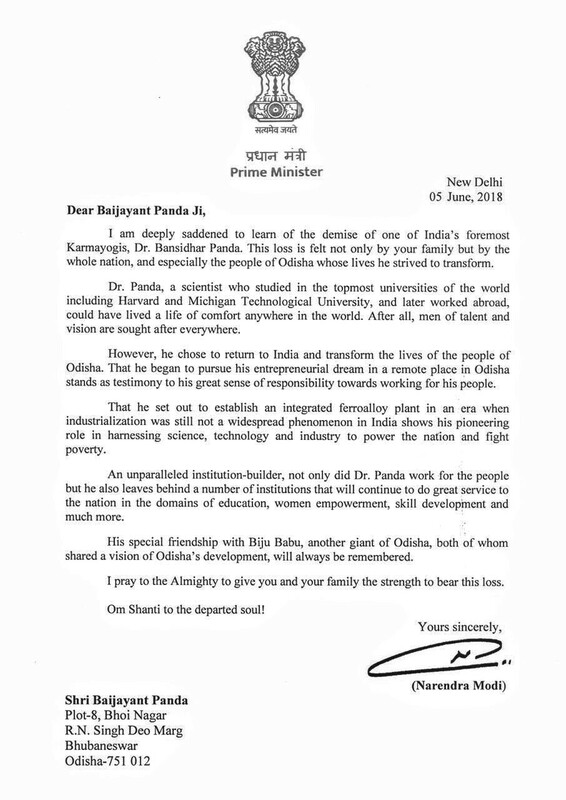 Prime Minister Narendra Modi sent a condolence letter to Dr. Panda’s family, hailing his efforts in transforming Odisha and also called him an unparalleled institution-builder. On this occasion, all family members of Dr. Bansidhar Panda, including Baijayant Panda, Subhrakant Panda, Jagi Mangat Panda, Shephalika Panda, Paramita Mohapatra, Nivedita Ganapati and Grand daughter Raisah Ila Panda were present. MP Baijayant ‘Jay’ Panda remembered his father, while granddaughter of the departed soul, too recalled her grand father. A Bhajan Samaroha was held on this occasion. While people cutting across party lines attended the event, the BJD leaders yet again failed to turn up.